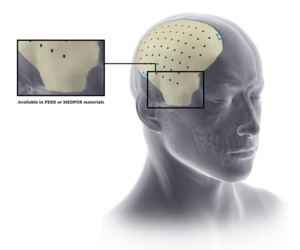 Cranial iD implants allow you to address your patients desire for complete restoration and aesthetic results that are available in the material of your choice including MEDPOR (porous polyethylene) and PEEK (Poly-Ether-Ether-Ketone). 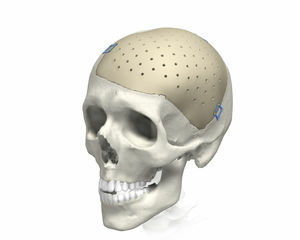 Each implant is uniquely designed to fit the bony void and individual anthropometry of your patient. Your input drives the artistry of each implant through a design session with a Stryker Design Engineer who takes your input and customizes an implant with exceptional anatomical fit and contour that is designed for an excellent post-operative patient experience. PEEK customized implants by Stryker are designed with exacting parameters to optimize the bone-to implant interface. 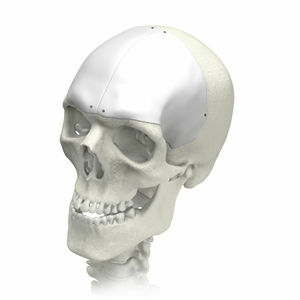 Multiple fit options are available to accommodate the needs of both you and your patient. PEEK CCI has a longstanding proven history with an excellent safety profile fully supported by documented clinical evidence. The “best in class” support and expertise of your local Stryker representative combined with the strength and fit of your implant allow you to close and reconstruct with confidence. Available in PEEK Priority (no design session) and PEEK Complex (requires design session). Further your ability to address patient needs now and in the future with your Pterional PLUS implant. This Stryker exclusive implant allows you the opportunity to prevent and correct persistent temporal hollowing (PTH) in your patients. Pterional PLUS can help patients regain confidence knowing they can look and feel like themselves again. This proactive approach addresses the aesthetic asymmetry that may occur due to atrophy of the temporal muscle/overlaying fat pad, and differs from standard solutions because PLUS offers reconstruction for both bony and soft tissues. The significance of this solution starts with the design session between the surgeon and the designer. This session allows the designer to augment and adjust the implant based on the surgeon’s requests. MEDPOR is a biocompatible, porous polyethylene material. The interconnecting, omni-directional pore structure may allow for fibro vascular in-growth and integration of the patient’s tissue. The material of this implant makes it easy to modify with a burr or scalpel.